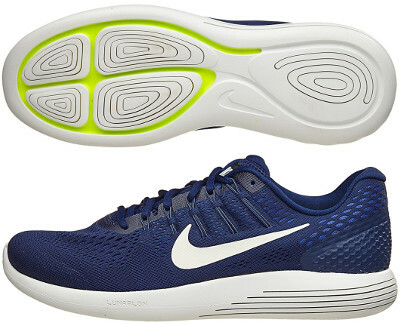 Nike LunarGlide 8 are stability cushioned running shoes. The difficult to define Nike LunarGlide 8 could fake it as casual sneaker and thanks to its impressive lightness could be tagged as performance running shoe but it is actually a daily trainer featuring great cushioning, outstanding comfort and not so impressive response. Just to provide a general idea, it would be comparable to more traditional Air Zoom Structure 20, although the LunarGlide 8 falls within "Run Easy" collection from Nike promoting comfort with soft cushioning and lower price tag. Upper in LunarGlide 8 is based on Engineered Mesh (sometimes is called FlyMesh from Nike) made of several layers and Flywire system with cables independently connected to round laces and partially hidden by external layer featuring snug but dynamic fit. Internal heel counter (TPU) provides some stiffness for extra stability although there are some complains because of excess room in heel cup. LunarFoam midsole with Dynamic Support is definitely oversized with firmer foam on external side (EVA codename Phylon) and softer one (Lunarlon) on internal areas to provide soft but solid cushioning, a great blend for mild pronation control. Eye-candy outsole design reminds topographical maps (no rubber at all) although often debris will get stuck in laser-cut grooves.